What to do with all that leftover pumpkin pie filling? Alycia had that problem the other day as she was baking a pie: she had extra filling and no extra pie crust. I was making biscuits and had extra dough. When two bakers come together with ingredients, the world implodes and beautiful food babies are born. Step 1: Extra pumpkin pie filling, no crust. Step 2: Make some biscuit dough. Step 3: Press some dough into a mini muffin pan. Step 4: Pour extra filling into biscuit crust. Step 5: Bake at 400 for 10 minutes or so. 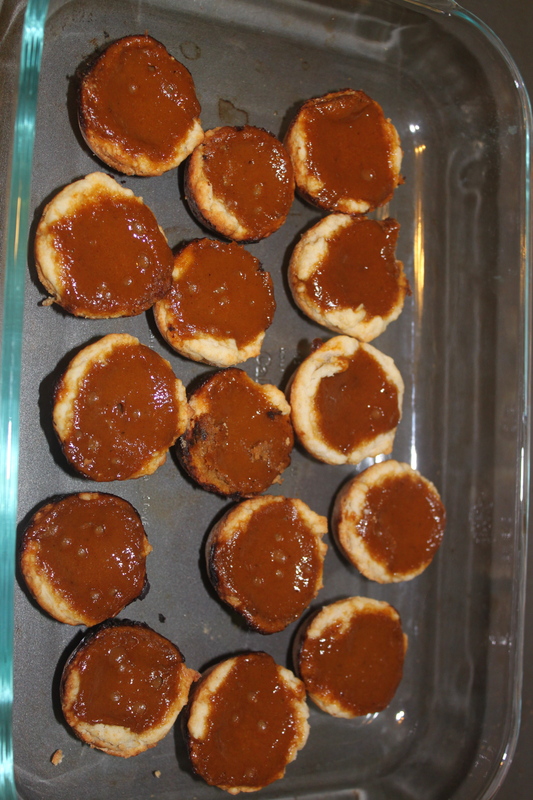 Step 6: Don’t burn your tongue as you eat these little goodies straight from the oven. Perhaps with a little whipped cream. This entry was posted in Dessert and tagged pumpkin pie on November 23, 2011 by Elyse. What could be bad about that!!! Great idea! Love anything in muffin tins!